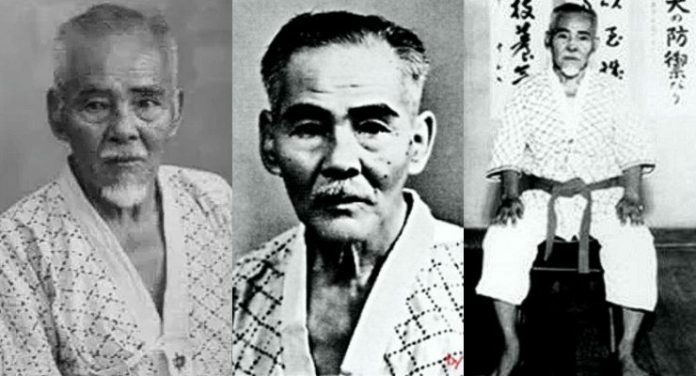 Nakamura Shigeru was an Okinawan Budoka who studied and taught Karate and Kobudo. 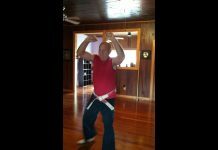 He established the name “Okinawa Kenpo”. Shigeru Nakamura was born on January 20, 1894 in Nago City. His father, his Uncle Teiichi Nakamura and family friend Choki Motobu of Tomari Te had introduced Shigeru to karate. Shigeru’s father died before Shigeru was ten but, thankfully, his father believed in education and Shigeru was sent to the prestigious Icchu Middle School in Shuri when he was 15 and this is where he studied and continued to train in the martial arts for 5 years. 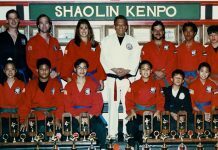 Both Kanryo Higashionna and Chomo Hanashiro were karate instructors at Icchu Middle School and karateka like Yasutsune Itosu as well as Kentsu Yabu also made visits to the school. After middle school, Shigeru Nakamura returned to Nago city where he trained under Shinkichi Kuniyoshi. In 1953, Nakamura opened his own dojo in Nago city and called his form of karate “Okinawa kenpo”. 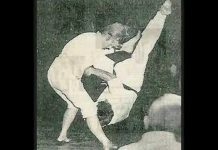 It is believed that Choki Motobu may have first introduced Shigeru Nakamura to Naihanchi kata. After his graduation from Icchu Middle School, Shigeru Nakamura went to the Prefectural Teacher’s Training College and continued to study to become a school teacher and to train in the martial arts. 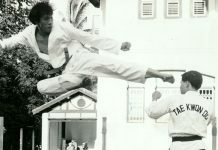 He was able to meet and train with other martial artists in the nearby city of Miyazato. He also continued studying with his teachers, especially Itosu Anko, from Icchu Middle School in a more significant manner, as he was no longer confined by the school’s program. After the Prefectural Training College Shigeru Nakamura returned to his hometown of Nago City to teach at Nago elementary school. He then went to Toyko, where he graduated from the special degree program of the University of Agriculture. After he graduated, he held a teaching profession in Nagano Prefecture, but then he received an invitation by the Kunigami district school to teach private lessons in Industry so with this honor he returned to his home town. Back in Nago City, Shigeru Nakamura, discovered Hinkichi Kuniyoshi, a well-known practitioner of Naha-te/Tomari-te and a student of Kitoku Sakiyama. Nakamura requested to train with Kuniyoshi and Shigeru Nakamura’s karate résumé and his dedication impressed Hinkichi Kuniyoshi so Nakamura was accepted as a student. Shigeru Nakamura went on to train with Hinkichi Kuniyoshi for over 10 years, becoming Kuniyoshi favorite student. 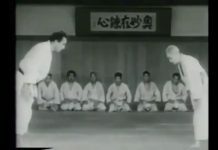 During this time, Kuniyoshi was willing to share his deeper experiences in Chinese Kempo with this student and Shigeru Nakamura advanced quickly in Kuniyoshi’s advanced system. 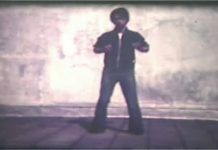 Bringing together the hard style techniques of karate with the older and softer style of Chinese Kempo, Shigeru Nakamura found himself following in the footsteps of the original founders of te. Hinkichi Kuniyoshi was known as ‘Iron Fist Warrior’ and he was known for his striking ability. Kuniyoshi passed on his striking knowledge to Nakamura, who became known as Chiki Bushi or the “Punch Knight”. Shigeru Nakamura art After his extensive study with Kuniyoshi, Nakamura’s methods had been forever changed, and his karate had become an integrated collective of experiences. Shigeru Nakamura was awarded his 10th dan, Hanshi by the Japan Karate Federation. Shigeru Nakamura passed away in 1969 from an incurable disease. He was 78 years old.